The audience erupted into applause when Hare Krishna! 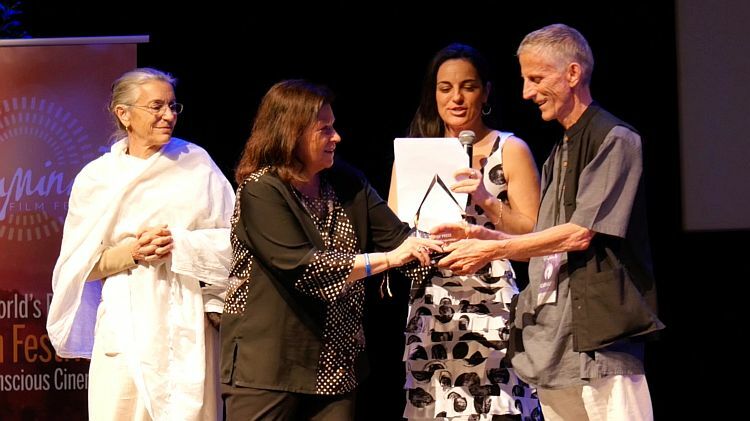 – subtitled “The Mantra, the Movement and the Swami Who Started It All” – was announced as the winner out of nine U.S. and World premieres. Jean later added that she was thrilled and encouraged the film was being so well-received by its intended audience – the general public outside the ISKCON devotee world. She also thanked Srila Prabhupada ‘for creating such a story with his life,’ and the hardworking Hare Krishna! team including Lauren Ross, Jessica Heinrich, Krishna Sanchez, and Srivas Perla. It turns out that this belief was well-founded. When Hare Krishna! was screened at the Mary D. Fisher theater during the Illuminate Film Festival, tickets sold out in half an hour and it had to be shown a second time at the larger Sedona Performing Arts Center. After the first screening, co-directors John and Jean Griesser and Lauren Ross participated in a Q&A. 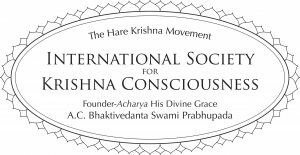 During the session, many audience members expressed their appreciation and said that they felt much more well-informed about the Hare Krishna Movement and its founder. The session also included a maha-mantra kirtan led by Dasarath Das and C.C. White that saw audience members dancing in the aisles. Sandra De Castro Buffington, founding director of the Global Media Center for Social Impact at UCLA said “she cried, laughed and was so engaged by the film she didn’t want to end,” according to Jean. Meanwhile Illuminate’s executive director Danette Wolpert has been an enthusiastic champion of the film since the beginning. Hare Krishna!’s win at Illuminate is likely to draw the film more interest from reviewers, theaters and filmgoers. Already it’s set to show at the Village East theater in New York City from June 16th to 22nd, the Laemmie Monica in Los Angeles from June 23rd to 29th, and other arthouse theaters in Boulder, Colorado; Providence, Rhode Island; and Houston, Texas throughout the summer, with more to be added. 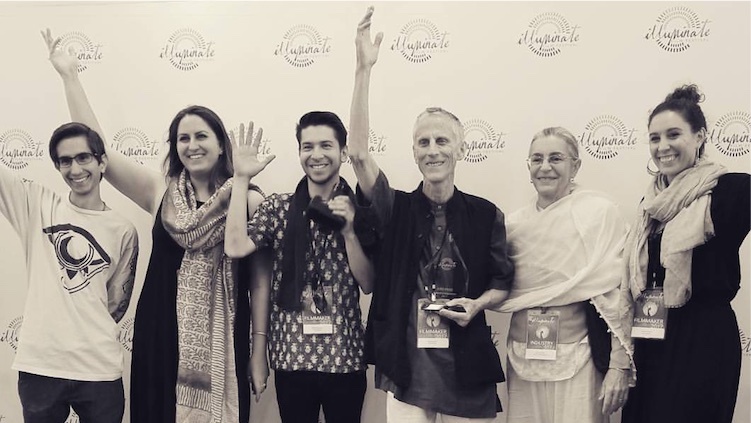 Jean Griesser says there is a grassroots movement to get the film shown in cities throughout the U.S. She encourages ISKCON devotees to contact distributors Abramorama (for larger venues) and Gather (for smaller ones). Devotees can then rent theaters in their cities, sell tickets to cover the cost and fill the theaters through advertising and word of mouth. And there’s no time better than now for Hare Krishna!’s message. 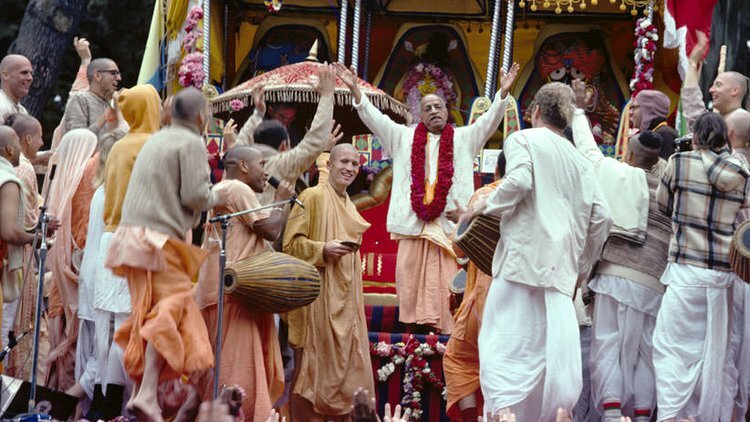 “The executive director of Illuminate commented – and I agree – that there is a similar wave of dissatisfaction and unrest in America today as there was when Prabhupada came in the sixties,” Jean says. “And there’s no reason why his message – that it is a revolution in consciousness that will solve the problems of the world — can’t inspire and be taken up by people now too.